Moved by all the negativity ion Ireland because of the Recession We decided to create and exhibitition which focused on the positive sides of Ireland and what it means to be Irish. This Year Niall and Daniel were again joined by Alan Magee. 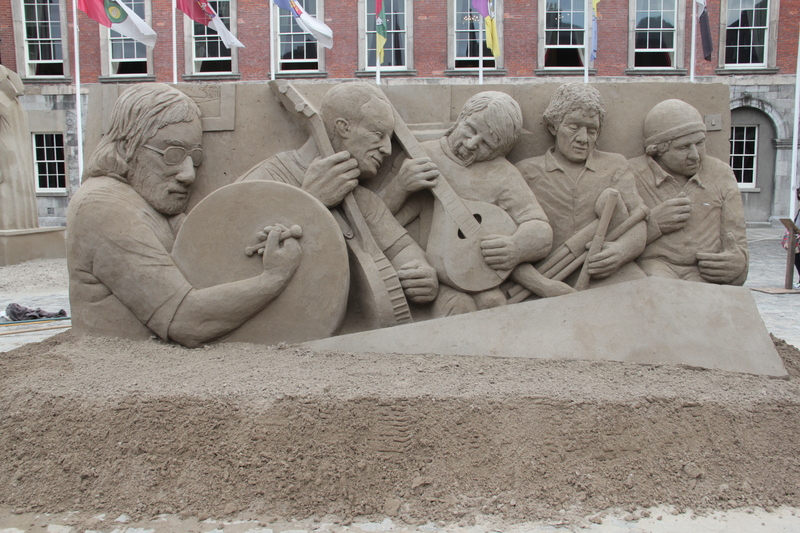 Due to budget restrictions it was not possible to bring some other carvers from abroad but there was enouigh sand to make four sculptures so Daniel and Niall decided to create one and a half sculptures each. 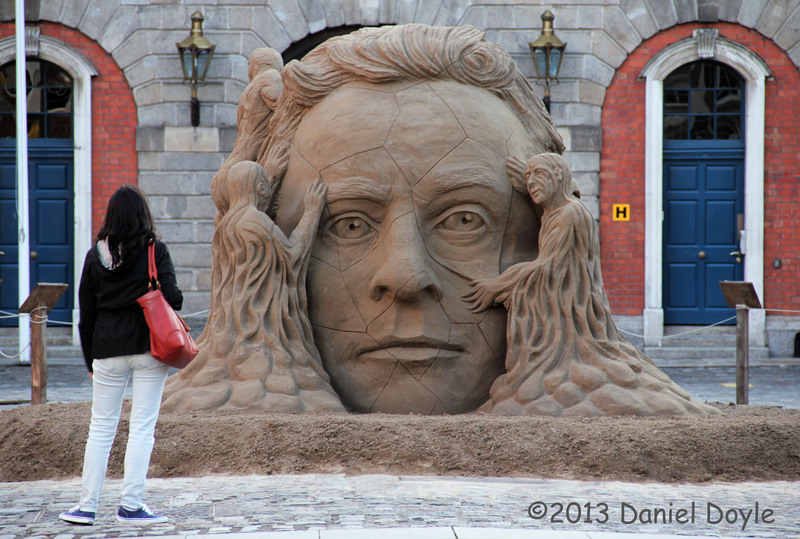 The half sculptures were actually two seperate sides of the same wall of sand. “What doesn’t kill you makes you stronger”; Daniel’s sculpture puts a positive spin on negativity. While we may have plenty to complain about in Ireland, both in recent years and historically, it has made us who we are today. Character building doesn’t try to hide the negativity, but implores us instead, to embrace its potential. The Irish people are known world wide as a generous people. Not just giving of donations to charity, (which they are one of the highest per capita), but in giving of their time. 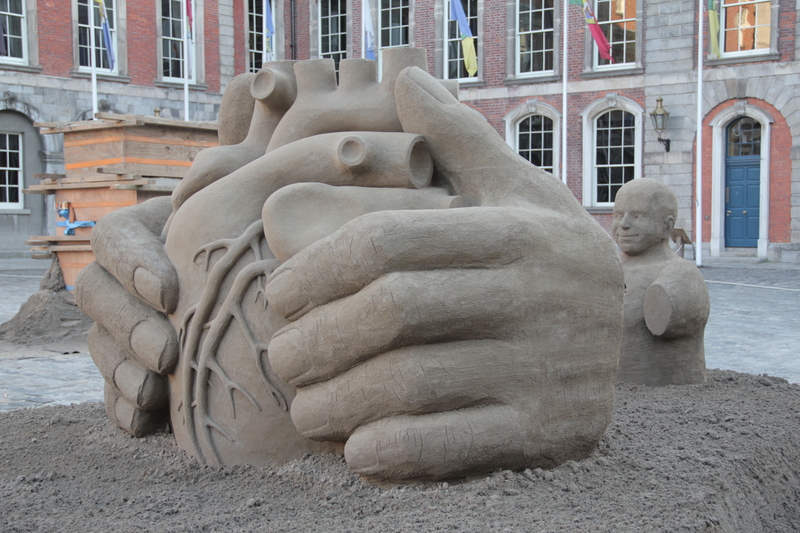 Using the motif of the Claddagh ring, this sculpture depicts the givin of ones heart, literally, as the symbol is substituted for the anatomical. The strong mother figure is a classic symbol of strength and resilience in Irish culture. From Peig Sayers to Bridget Brown (mother of writer and poet Christy Brown), the arts have celebrated the ‘Irish Mammy’; pillar of society, holding the household together. 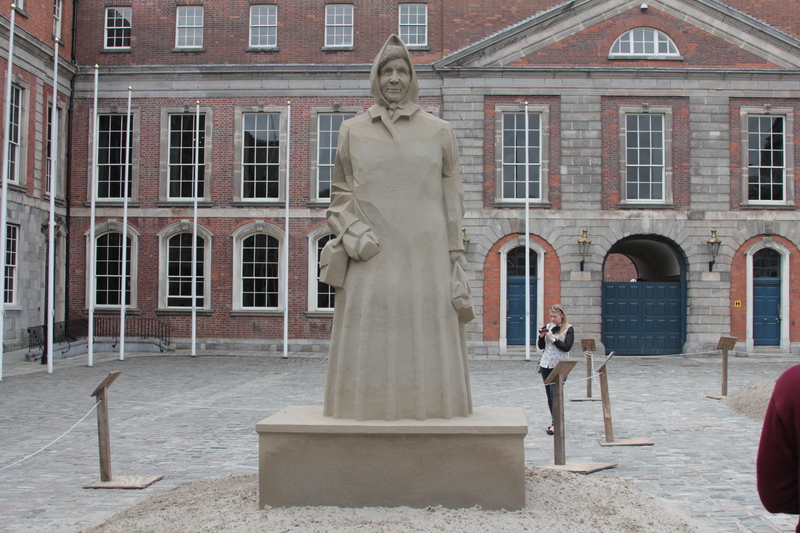 This sculpture celebrates that character, as the everyday unsung hero of Irish family life, the epitome of resilience. Two things that the Irish are renowned for is their love of music and talking. In this Sculpture Niall and Daniel wanted to celebrate these traits. On one side we have Nialls depiction of the impromptu music session with the instruments which have created that particular Irish sound, including the kitchen cutlery. On the other we have Daniels ode to the Irish orators inspired by Samuel Becketts ‘Not I’.